Well, it is coming down to the wire for me. I am 33 weeks pregnant and due around Christmas. These last few weeks have been tough. I have been totally exhausted and my motivation level has really plummeted in comparison to my usual super mommy self. And in addition to being really tired, I have been struggling with a of the usual and annoying pregnancy symptoms. I think as you get farther along in your pregnancy they get even worse. So, here is the list of the most common pregnancy symptoms. Nose Bleeds & Nasal Stuffiness – I wrote a whole blog post on this. Check it out here. Vaginal Discharge – OK, come on, when you are pregnant, your period is supposed to stop right?! Who wants to have an annoying discharge? For the past several months I have been stuck using panti-liners which really do help a lot to keep things dry – but still annoying! I did read that this will also increase in amount until the baby is born. Ugh! But please remember that if there is ever a change in color or an odor, you should report it to your doctor or midwife. Gastrointestinal Distress (Burping & Gas) – The hormones of pregnancy have sent my gastrointestinal tract in a spin. The unladylike affliction of belching, burping and gas are fairly common. My last 3 pregnancies I struggled more with the heartburn and acid reflux, but for some reason with this pregnancy I am plagued with this horrible burping syndrome. I burp constantly and I have to be honest with you, I hate burping! They say to try and avoid offending foods and never hold the air inside because it can cause pain. Constipation – This actually just started for me about 2 weeks ago. The hormones of pregnancy can cause your intestines to slow down and become sluggish. So not only am I constipated, but I am also getting hemorrhoids from trying to push. Ugh! Drinking plenty of water and eating high fiber foods can be very helpful in this issue. There are also medications that you can take, so be sure to ask your doctor if you are really having a hard time. Lower Back Pain – This has always been something that I have struggled with. I am usually a pretty small framed person and it seems like all this extra weight really puts a lot of pressure on my lower back. I am not able to roll over very easily when laying down or get up easily from sitting or laying down. I pretty much have to moan in agony because it hurts so bad. But the funny thing is, that once I give birth the pain goes right away. So I keep that in my mind and try not to complain too much. Heating pads can give some relief and of course not overdoing it like I often do by staying on my feet for too long. I think taking it easy is the best bet at the end of any pregnancy. How about you? 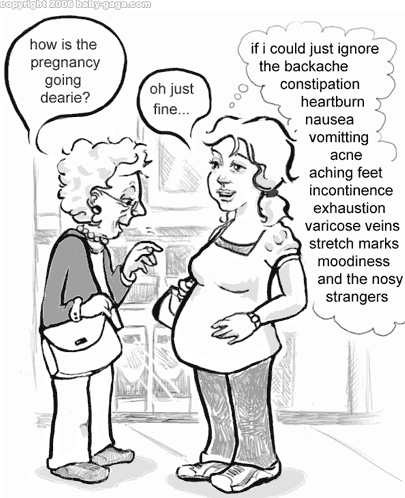 What annoying pregnancy symptoms did you have to go through? .-= NighT Owl Mama´s last blog ..Winners for Hugg-A-Planet and 16×20 Canvas Print =-. You make some great points! My symptom was peeing! I drank lots of water to help with the constipation and heartburn, but then I peed all night. There were times when I wanted to sleep in the bathroom because it was so bad! I just wanted to sleep before my son was born and I woke up to waddle to the bathroom and then I couldn’t fall right back to sleep. Oh and waddling sucked which is what I did too, especially because my feet were so swollen that I could only fit in 1 pair of streched out gym shoes! But my boys were worth it! I had lower back pain a lot and the burping and gas along with Heartburn badly with all of my pregnancies! I don’t miss it at all! I feel for you so much and hope for a safe and happy arrival and that you can relax in the meantime to keep healthy! .-= Brandy´s last blog ..Current Giveaways =-. I am dealing with all of those symptoms right now and the thought of it getting worse is scary. Did I know you were pregnant? Probably, but my pregnancy brain gets the best of me. Just think, you only have a few more weeks to go. Hang in there! Congrats and Happy Thanksgiving! .-= joanofalltrades´s last blog ..Funny Friday: Weekend with the Peeps =-. Awe. Hang in there hunny! It will be over soon and then you’ll have that precious little one to snuggle and cuddle and you’ll be saying “it was all worth it”. .-= Mary Lutz´s last blog ..Hospital Staff Does the “Pink Glove” for Breast Cancer Awareness =-. reading this was like a trip down a nightmare memory lane! I feel your misery like it was yesterday, but it’s all worth it when they finally come out, but you know this already!!! hang in there! .-= Teresha@ Marlie and Me´s last blog ..Many T.H.A.N.K.S. =-. What a GREAT cartoon! Sorry you’re going through the discomforts at the end of the line, but… you’re almost there! Hang in there. The rewards are sooooo sweet. I actually grew a small patch of hair on my chin :-(. Sooooo unattractive! .-= Insomnia symptoms´s last blog ..Terminal Insomnia =-.